A special CBI court in Ranchi during the day convicted RJD chief Lalu Prasad Yadav and 15 others in a case relating to the multi-million rupee fodder scam. 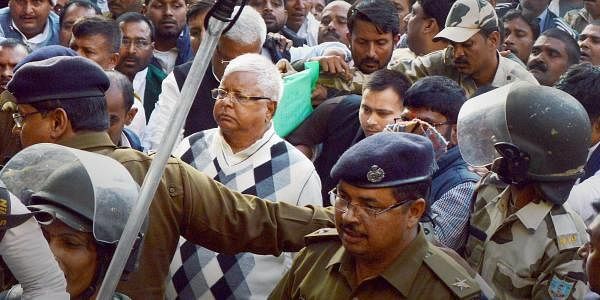 KOLKATA: The CBI's retired Joint Director (east) Upen Biswas, who had relentlessly pursued Lalu Prasad and others accused in the fodder scam, on Saturday said the case was "so strong" that the former Bihar Chief Minister as others named in the scam were certain to be punished in one case or another under it. "Lalu Prasad has been sentenced in two cases. Who will get punishement or not in a specific case, I can't say. I don't remember the names also. Lalu Prasad, Jagannath (Mishra) I remember. But I have forgotten the other names," Biswas, now a minister in West Bengal's Mamata Banerjee government, told media persons here. "The case was so strong,... he (Lalu Prasad) was certain to be punished," said Biswas. A special CBI court in Ranchi during the day convicted RJD chief Lalu Prasad and 15 others in a case relating to the multi-million rupee fodder scam. The court acquitted another former Bihar Chief Minister Jagannath Mishra and five others in the case, related to fraudulent withdrawal of Rs 84.5 lakh from the Deoghar district treasury. The CBI court will pronounce the quantum of sentence on January 3. Asked about Mishra being acquitted in the case, Biswas said: "He may not have been adjudged guilty in this case, but he has been punished in another case. "Be it Lalu, or some others, if they have not been found guilty in one case, overall, they are bound to be punished in the scam."